Candylicious at Dubai airport ... a bottle-shaped fridge and the Colourful Awning are key design features. 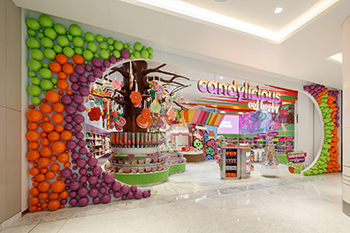 Candylicious is known for selling candy in lively and enchanting outlets and H2R kept that in mind when it was designing two of its stores in Dubai. The designs are evolved formats of the brand’s original identity, executed with new sophistication and technological advancements while paying homage to their flagship stores in Yas Mall and The Dubai Mall. The new stores are a sweet escape, providing a fun, dynamic and playful retail experience for all, while evoking childlike eagerness, delight and intrigue. 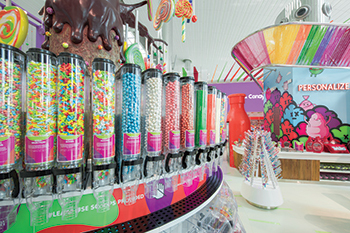 Candylicious stores can be spotted from a distance, welcoming visitors with candy-coloured bliss, says Husain Roomi, co-founder and partner at H2R Design. 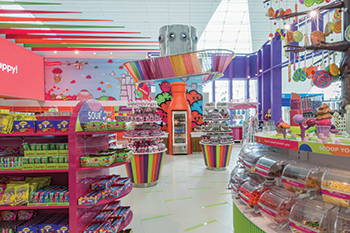 Candylicious at Dubai airport ... a whimsical candy land. “With that in mind, we knew the spaces had to be designed to be lively and enchanting while maintaining the right balance amidst the vibrancy. We emphasised caution when weaving in the architectural characteristics, the functional displays, product ranges and artistic features and this resulted in harmonious spaces amongst the plethora of elements,” he adds. H2R Design studied the core concept of playfulness and fun when reimagining what the two new Candylicious stores would look like. For each store, it looked deeply into the target audience and how to create memorable moments and an exciting shopper journey for children and adults. Adding touches of intricacy in the detailing of the design, H2R Design was able to create a whimsical candy land, full of opportunities to play, discover and enjoy. Playing with the brand’s vibrant colour palette and clean shapes to ornament the overall space led to the creation of colourful, strong and elaborate interior spaces that lend themselves to exploration and experimentation. Roomi says H2R Design’s work for Candylicious began with the airport branch, which as a stand-alone store, has no ceiling. However, to exude an indoor/outdoor feel, it added an awning – an overhead metallic feature with colourful strings and flowing fabric strips. This serves as connective transition, complementing and tying the space together. These features were later implemented to The Dubai Mall store to extend a cohesive and consistent design. Amongst the most notable design features for each of the stores include the Colourful Awning, which creates a dynamic flow placed overhead in the absence of a ceiling. The metallic structure with colourful strings and flowing fabric strips helps define the dimensions of the space. Candylicious at The Dubai Mall ... a sweet escape. 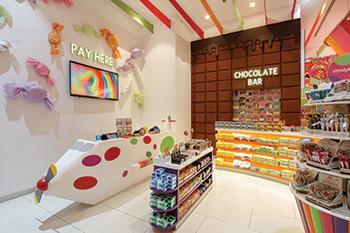 The Chocolate Wall richly displays a selection of premium and luxury chocolates, while a Big Lollipop Tree at the entrance is an engaging feature that ties back to the brand’s identity where shoppers can fill up their own selection of candy bags. The Candy Cities inside the stores have elements relating to their respective locations. Hence, the one at The Dubai Mall displays the Burj Khalifa and other iconic Dubai landmarks, while the store in Terminal 3 has little candy airplanes and a runway. Graphics on the walls provided by the street artist Myneandyours adds colour and narrates the continuation of the candy story and atmosphere. A bottle-shaped fridge was also designed to store refreshing drinks and invites consumers to engage with the design. Interactive screens have been installed with “Candylicious Play”, a game that offers visitors another feature with which they can interact with. The designs also allude to Candylicious’ ethos of being in a happy vibrant space, inside out, top to bottom spreading the aura of colourful sweetness and joy. H2R is a young, dynamic London/Dubai-based design firm founded by brothers Hasan and Husain Roomi that has designed some renowned commercial and hospitality spaces across continents. The Chocolate Wall ... displaying premium and luxury chocolates. Supported by a design team with broad global experience, H2R maintains a diverse commercial portfolio with a primary focus on the hospitality sector. As the various disciplines of design often overlap and integrate, H2R endeavours to offer a total concept; this includes branding and identity design, bespoke furniture and fitting design, salvaging and appropriation and even sourcing site locations. The result is unique and customised spaces that respond to client briefs. With projects such as Tom & Serg, The Sum of Us, Paperfig, Leopolds of London, GIA, Symphony, Two at Symphony, Parkers, Candylicious, Hardee’s and Alamein Hotel in Egypt, in addition to a wide spectrum of others, H2R Design is now on the global design map. Clients include Emaar Hospitality Group, Emaar Malls, Roya International, Al Abbar Enterprises, Mohamed Al Hilal Group, Pizza Express, Foodsters and many more.